The cover of this album is of the kind that makes me wonder whether I have to take its contents seriously or that I'm looking at the equivalent of the Hee Bee Gee Bees of metal. What better place to start with then the bio. Except for the music itself of course. The first and title song, 'Leather Teeth' tells me al. From a typical Supertramp organ to Europe singing, 80s synths and metal drums underneath a strange lyric about "A leather monster of the night". What to make of it? The bio tells a lot of things except who Carpenter Brut is. A synthwave or a darkwave for that matter, artist. The storyline is we are hearing the real soundtrack to an imaginary movie situated against a backdrop of 80s metal. Yes, hair and all. Fact is that the music does have a lot of it, except for the synths that are predominant. Singing is clearly optional. From that moment on everything is possible. Starting circa 1978 with Justin Hayward singing about the landing of aliens from Mars, the music takes us past Van Halen's violining technique into the poppy side of metal. 'Monday Hunt' holds this all and makes me want to sing "chances of anything coming from Mars are a million to one they say". 'Inferno Galore' joins the metal pace with the synths of Yazoo, Pet Shop Boys, Erasure, the pulse of Giorgio Moroder and TV themes of the 70s and 80s like The Persuaders and Miami Vice. It just makes me ask one question: Who is this guy/who are these guys? Whatever is going on, it is extremely poppy and catchy. I won't say that I would like to get up or go to bed with this music, somewhere in between there's a place for it for sure. Wikipedia helps some. 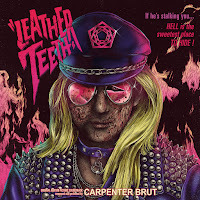 Carpenter Brut is Franck Hueso from Poitiers. Someone who wants to make his music anonymously to put more emphasis on his music. A fair choice. Since 2012 he's released three EPs, bundled into an album in 2015 called 'Trilogy'. This makes Leather Teeth his first full length album, with its 32 minutes over before I know it. Longer the album does not have to be as far as I'm concerned. Huesco makes his music quite seriously, but somehow it does have something of a joke as well. Intended or not, that is the effect of throwing his all into this bundle of, well, nearly everything, barring French chansons and opera. All I can add is that the level of proficiency on the individual instruments is of an extremely high level. As I wrote there's no joking here. There's so much speed, melodic prowess, o.k. the singing is not that superb, and great rhythm. It makes Leather Teeth an experience and an adventure. A strange one, sometimes weird, yet highly enjoyable one. 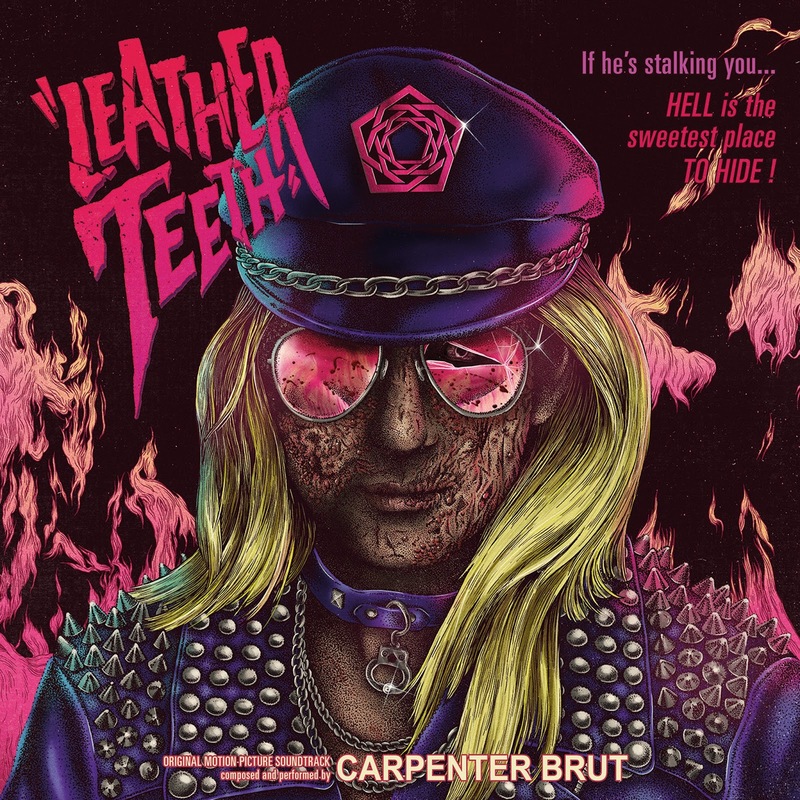 If Carpenter Brut is a joke, it is one of the best ones ever. A joke that puts the Hee Bee Gee Bees to shame for the sorrow joke they were. I can place it the same level as Captain Cheese-Beard's album celebrating Frank Zappa some time back. Simply extraordinarily done.